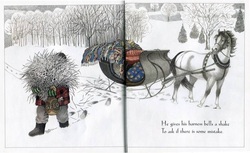 This blog is a purely biased examination of popular children's books that have been re-issued with new illustrations and, sometimes, new text. It is the result of several years of thought and several months of study. And I haven't stopped. Almost every other week I discover another book that has been published with a "new updated look!" Although the title of this project is Classics Re-Illustrated, I haven't limited my scope to just classics. However, I am slightly picky about what I'll include. Illustrated versions of folktales don't really count. By their very nature, folktales are told again and again so we expect to see new versions come out every once in a while. For the most part, I looked at picture books, not chapter books. Of course, there's an exception to every rule. I will mention a couple of chapter books. There might be one or two folktales included. And, while I was mainly interested in picture picture books, a collection of poetry found its way on my list. There might even be a few other non-fiction books in the future.